RICE: $17.50 which includes US shipping. 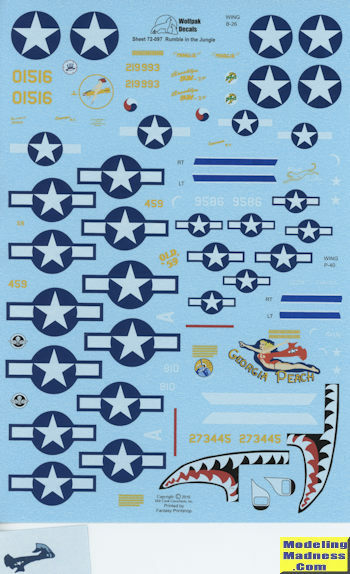 This is the second of Wolfpak Decals' full WWII sheets and this one is also USAAF and Pacific theater. Again, OD and neutral grey are the predominant camouflage colors. I should note that in this and the previous sheet, there is a nice explanation on US interior and exterior camouflage colors and why it is silly to be pedantic about shades, especially when working with greyscale images. These are all mostly later war aircraft and there is a nice selection of options. FIrst is a P-40N from the 418 NFS at McGuire Field in the Philippines in April 1945. I can only assume it was a hack and it carries the name 'Rusty'. A P-39Q, the 'Brooklyn Bum 2' is the next option with the proper New Guinea white ID markings. This one was from the 82 TRS/71 TRG in early 1945 from Tadji Airfield in New Guine. 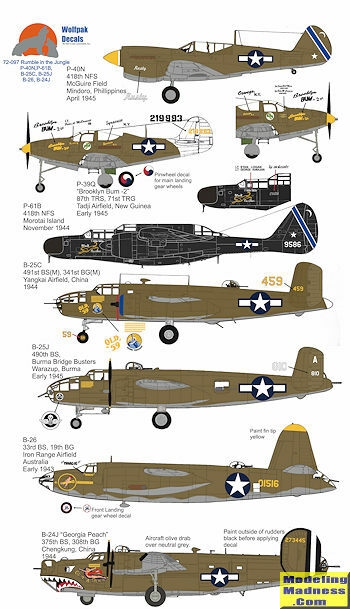 The third 418 NFS plane on these two sheets is a P-61B in the expected overall black. It is 'Black Panther' and based on Morotai in late 1944. THe first of two B-25s is next. This is a B-25D from the 491BS/341BG based at Yangkai, China in 1944. It is named 'Old 59' after its serial number. A B-25J is ncext, from the 490 BS in Burma during early 1945. This one has a standard bomber nose without the additional guns. A B-26 is next and from the 33 BS/19BG based at Iron Range Airfield in Australia in early 1943. It is named 'Maggie' and has a nice unit marking on the nose. Note that the instructions recommend either the Valom or Monogram snap kit. However, the Monogram kit has the wrong tail gun housing to do this scheme. Finally a B-24J 'Georgia Peach' from the 375BS/308BG based at Chengung, China in 1944. This one has a fearsome shark mouth. As the color of the cape of the nose art is in question, a blue overlay is provided should you decide to use it. There are kits available for all the subjects so modeling any of these will be easy enough. As usual for Wolfpak, the decals are superbly printed by Fantasy Printshop and the sheet comes with the best background information provided by any sheet in the business. Note that the Fantasy Printshop decals are quite glossy so you'll need a clear matte or semi-matt coat over these once they have been applied. Thanks to WolfPak Decals for the review sample. Visit them at their web site and pick up yours.